ENJO’s unique and innovative fibres are our focus, allowing us to offer our Customers a healthier, chemical-free lifestyle. ENJO Fibres are ultra-fine, and each ENJO product has a unique, tailor-made makeup of five raw materials, specially designed to suit the purpose and the surface you’re cleaning. Polyester, acrylic, polyamide, viscose and cotton. Each raw material is non-toxic, environmentally responsible and durable. ENJO Fibres can be weft knitted, woven or warped knitted, depending on the product and its purpose. The weave for each product is entirely unique to ENJO allowing us to offer an unparalleled clean. Water works to loosen dirt and bacteria from the surface. 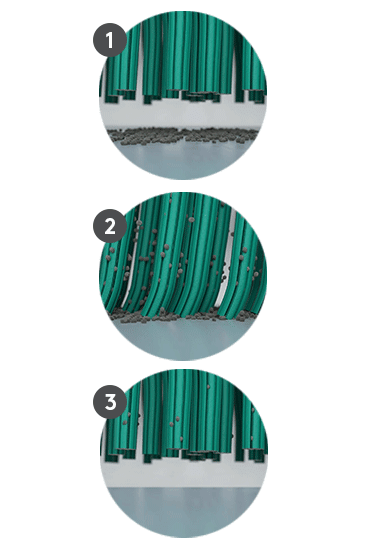 The ultra-fine fibres are wedge shaped, and the exclusive composition mean ENJO reaches every crevice, and the unique weave works to trap and physically hold dirt and bacteria, which is released when the fibres are washed. Each fibre product in our range is lovingly handcrafted by expert seamstresses in our headquarters in Austria. Before they reach us, each individual product is hand checked for quality and longevity. It has taken time and expertise to create the perfect composition of fibres to suit the surfaces in your home…so to make life simple, we’ve colour coded our range to indicate the area of use.